It was when the Dep.Ed. announced that all schools in Quezon City will be on a special holiday for the annual State of the Nation Address of the president. An instant 3-day long weekend for me. 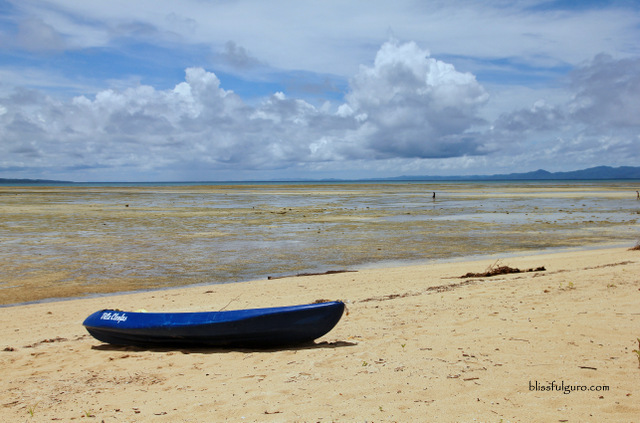 I immediately texted a friend to plan for a quick trip somewhere and we both agreed on going to Cagbalete Island. 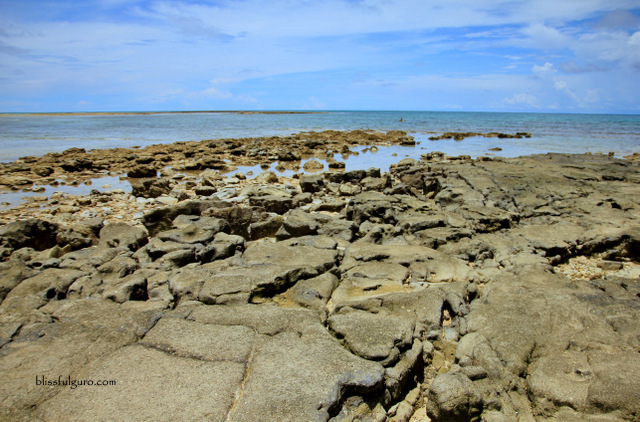 Mauban in Quezon is the jumping-off point to the island of Cagbalete. We were at the JAC Liner bus terminal in Cubao at around 4:30 a.m. The only direct Mauban-bound bus was scheduled to leave at 5:00 a.m. but we left at around 4:45 a.m. when the bus was already filled up. Our bus supposedly has a free wi-fi but we didn’t get to connect to it on the whole duration of the trip. 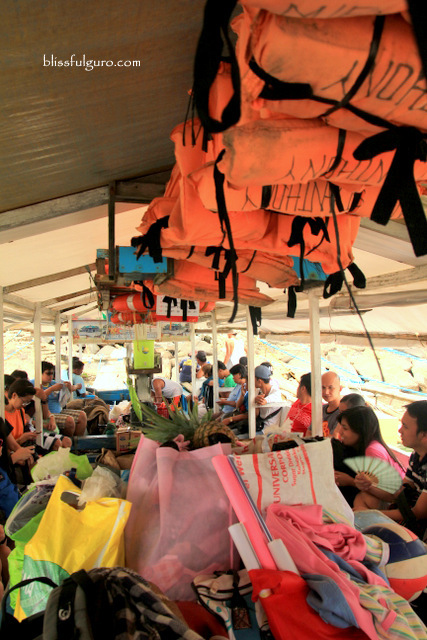 We arrived in Mauban at around 9:30 a.m. We transferred to a tricycle (10 pesos each) that brought us to the Barangay Daungan pier where the boats heading to Cagbalete Island are located. 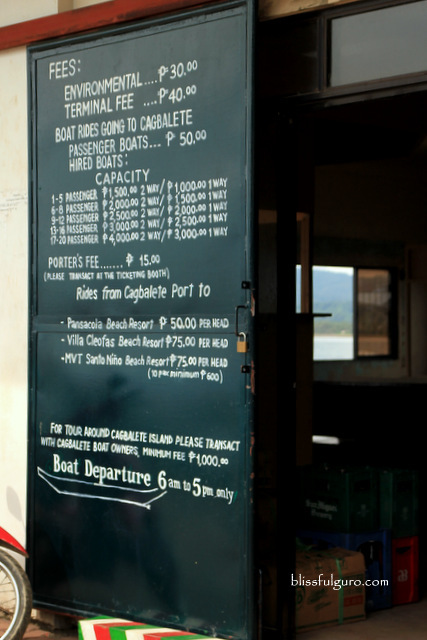 At the port, we paid 30 pesos each for the Environmental Fee and 40 pesos each for the Terminal fee. 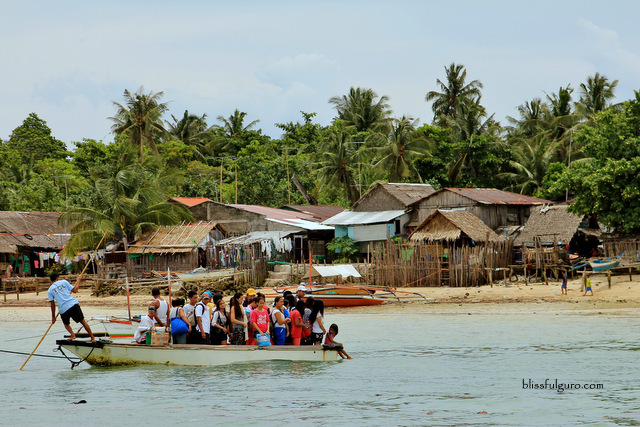 The boat fare was 50 pesos each which was paid directly to the boatman. We were really hungry at that time and didn’t even get the chance to have a decent meal somewhere. And then we saw a local favorite pancit habhab that was sold on a stall near the port. 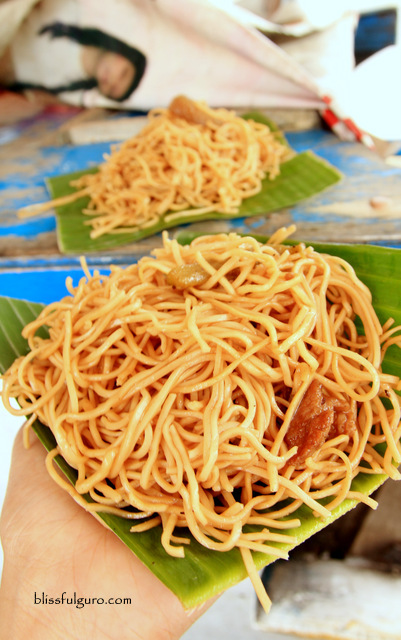 For 10 pesos each, we enjoyed the simplicity of this pancit the local way – no need for utensils and stuff. Two boats were scheduled to leave at 10:00 a.m. that day (Saturday) and we were lucky enough to get there just in time or else we would have to wait for the next boat trip schedule at 3:00 p.m. During summertime, boat schedules may be as often as every hour, everyday. You may also opt to hire a private boat if you’re in a large group. The 45-minute boat ride didn’t bore us. Maybe it’s because of my extreme excitement to finally hit the beach after a few weeks of work and school tensions. Or maybe the tranquility of the sea. 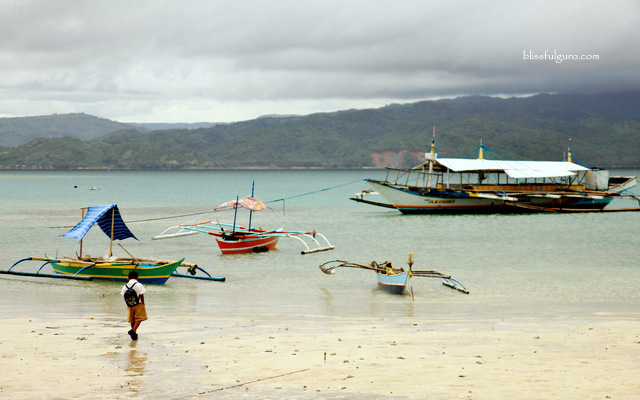 Arriving at the Sabang port in Cagbalete, we had to transfer to a smaller boat for us to reach the shore. 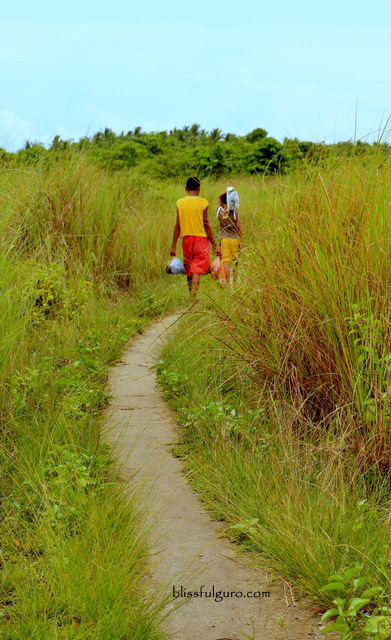 Right before that, a few kids were offering to guide us on the trek to our chosen resort. We were hesitant at first but because we were too tired and hungry to navigate it on our own we agreed to the offer. And so we got some assistance from two kids who helped us navigate the seemingly impossible way to the resort. 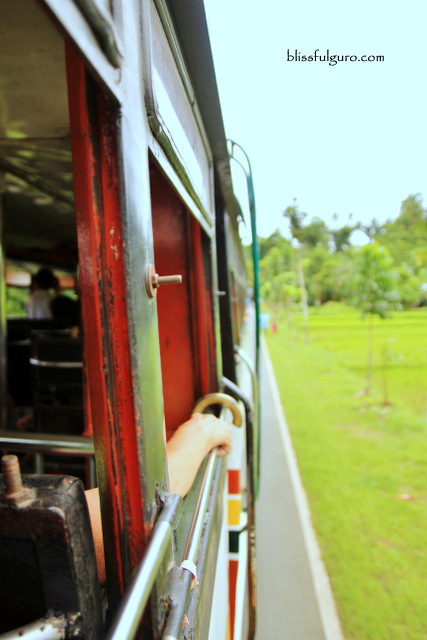 It took us almost 45 minutes to reach the Villa Cleofas Resort and handed the kids a few bucks for guiding us. We had a prior reservation for their standard double room so checking in was a breeze (check out their website for room rates). There were no other guests during that time so we practically owned the whole resort. Ayos! The room’s just basic. 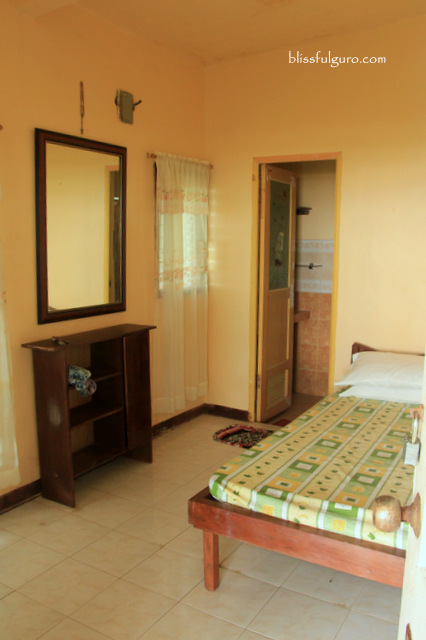 It has a double bed, an electric fan and en suite toilet and bathroom. No TV that would distract us on our holiday. Also, power supply on the island is limited. The resort has its own generator set that they usually set off at around 6:00 p.m. to 5:00 a.m. daily or depending on the volume of the guests. Mosquitoes were everywhere so you better spread some repellant-love on your bods. Food would have to be a problem during off-peak season. They only serve meals on large groups which left us with no option but to prepare our own during our 3-day stay. The owner clarified this beforehand so we did some grocery and market shopping before we got there. 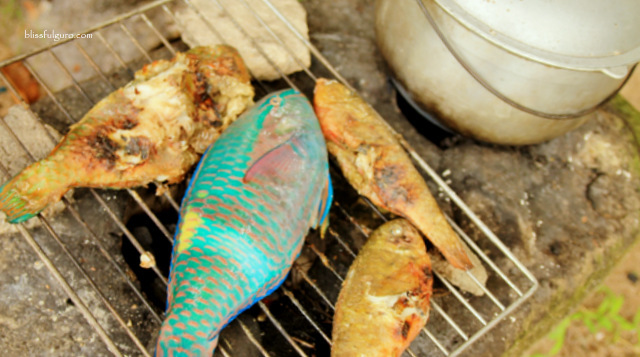 Luckily, we scored some fresh fish on the Sabang port for a bargain which served as our first meal on the island. There’s also a “cooking fee” everytime you use their table top stove. But all the other kitchen stuff and utensils were free of charge. Cooking our food over some charcoal was a task. Our first lunch was served after 2 hours of prepping and cooking. Our meal was a total disaster and we just laughed about it. The next meals were prepped on table top stove which was a breeze. 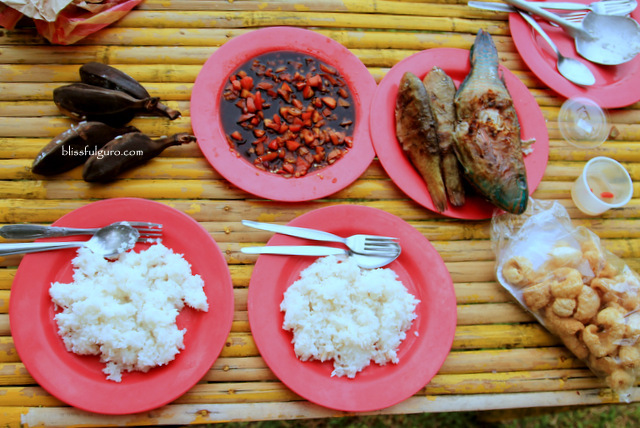 My favorite meal was this lunch served on a banig. 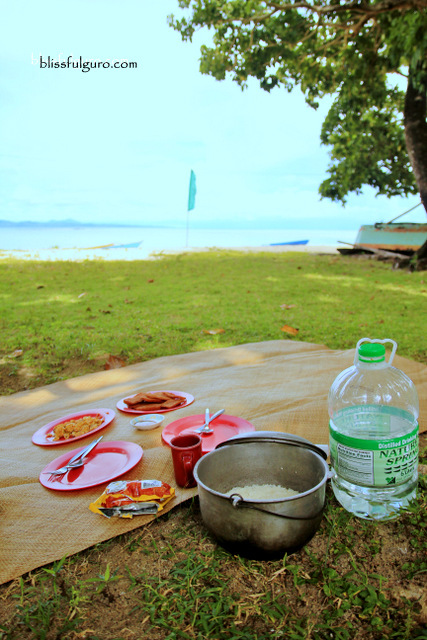 The simple Ma Ling and scrambled eggs were made special by the perfect view of the beach as backdrop. If there’s no power supply, the next best thing to do is to chill for the rest of the day. This gave me time to plan for my future travels. I brought a book with me and planned to finish a couple of chapters but that didn’t happen. After a few pages, I effortlessly snoozed up. 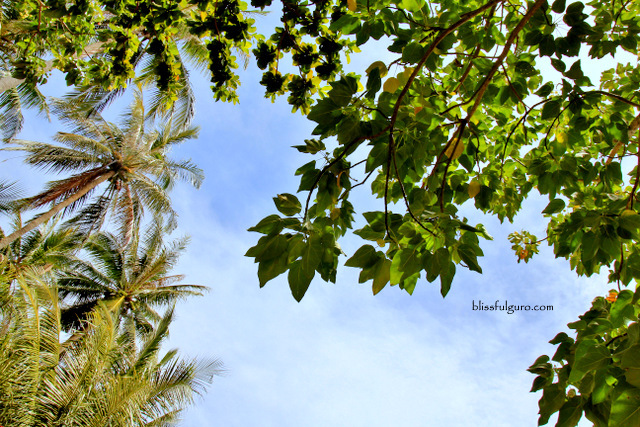 My tired body resting on a banig under the trees with the sound of humming birds and the sluggish waves. The ivory-colored sand is not that fine but free from sharp rocks and pebbles, the seabed as well. 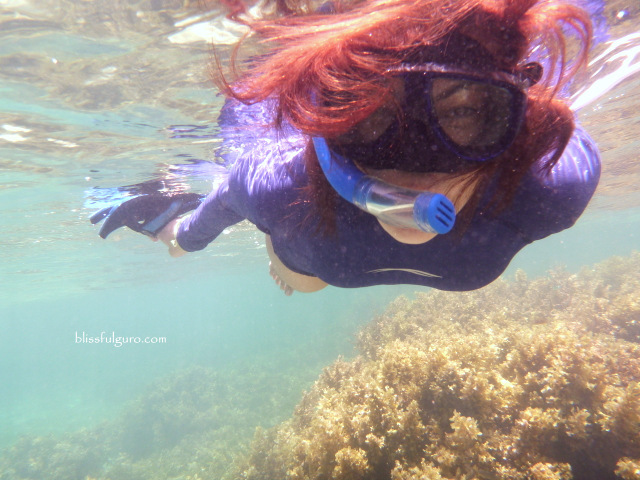 Low tide is my enemy; I don’t like swimming on knee-deep (or even waist-deep) waters, so I usually stay out of the waters during those times. After siesta, we’ve decided on exploring the island. 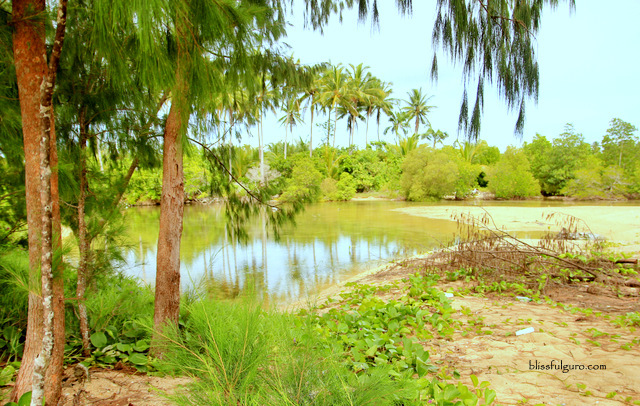 We went out for a walk and our stroll led us to a river at the end of the whole stretch of the beach (left side). There’s a nice creek and a river on that end. I loved the area where the river meets the sea. The raging water from the river reminded me of water spa treatment – for free. 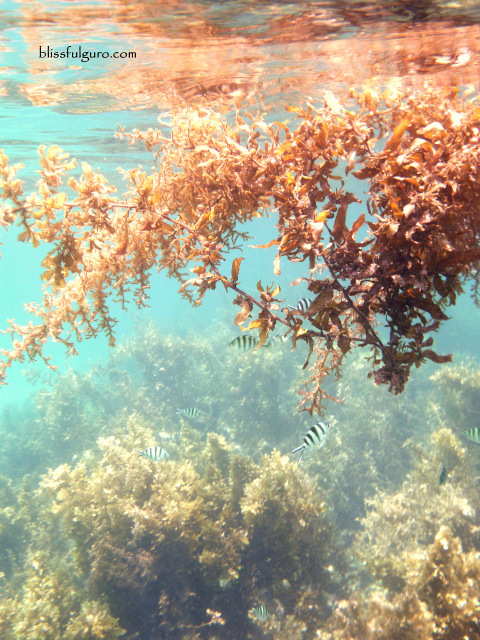 Another interesting activity to do during low tide is to explore the Bonsai Island a few hundred meters away from the resort. 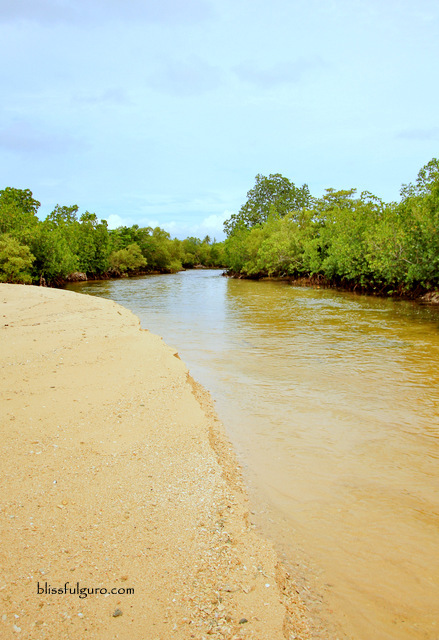 It can only be reached during low tide as you can walk the whole stretch of the ankle-deep waters. The rock formations are nice and picturesque. But be careful for the sharp corals and rocks on the way. Aqua shoes or just plain flip flops is advisable. 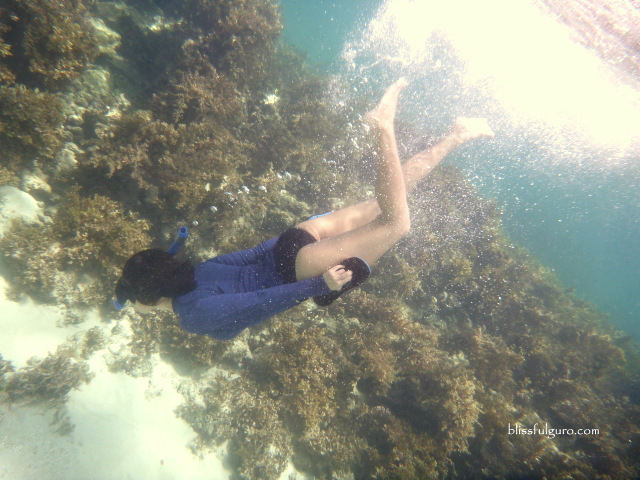 But what’s more interesting to find out is the underwater scene of the island. We weren’t expecting anything but it was nice down there. 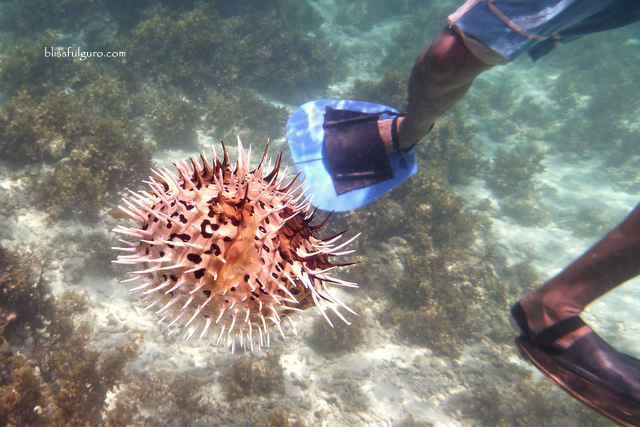 We didn’t notice that we were snorkeling for two hours already until our stomachs grumbled. It rained at times during our stay there but that didn’t hurt at all. We were surrounded with everything we needed; food, shelter and nice conversations. The basics and more. Just the perfect holiday I need. 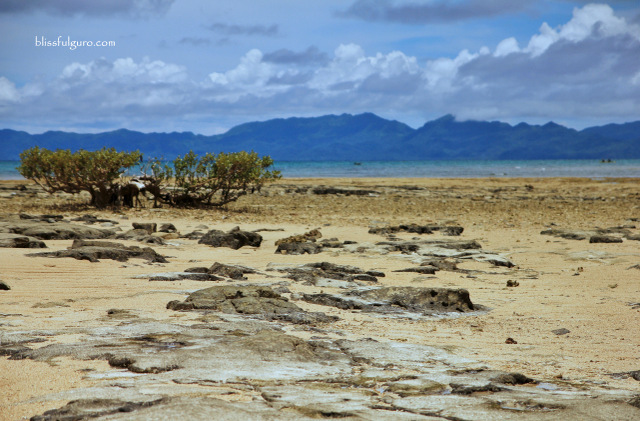 Cagbalete Island is nothing but nature at its purest form. No power supply, no restaurants and definitely not a party place. Our stay was fun in spite of it all. A good company with the perfect view of the beach is just plain perfect. Nothing more, nothing less. At may kulang na pic/shot sa post na ito. Asan na? eheheh. As always, lovely place and good photos to show..
Ako din miss ko na to! Would love to go back minus the strong waves! hehe! Nice post Ma'am! 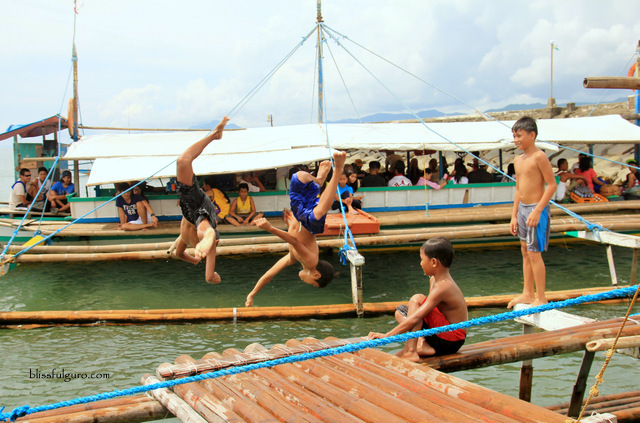 love the photos, namiss ko bigla ang beach! dami ko pang di napupuntahan! Hi! This is such a nice blog. Ganito din kasi yung trip namin ng bestfriend ko, magtravel kung saan kahit dalawa lang kami. 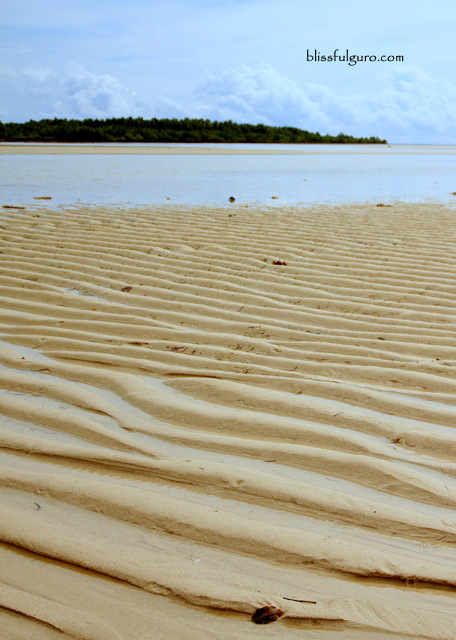 I'm planning to go to Cagbalete this Thanksgiving, last week of November. Sa Quezon ako lumaki but never we never knew this island til some people posted blogs like this bout the island. I just wanna ask if magkano naging budget nyo during this trip lahat2 kung 2 lang kayo? Hoping for your reply. Thanks. Hi there ma'am. 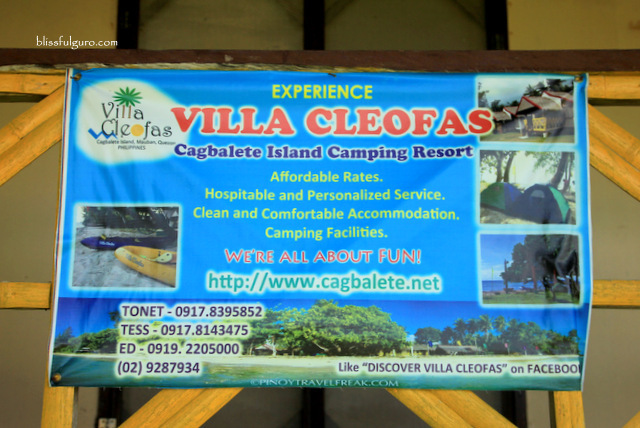 :) villa cleopas lang po ba yung resort na pumapayag mag pitch ng tent? chaka 7k po nagastos nyong dalawa? Nakita ko po kasi sa ibang mga bloggers naten na yung iba 1k lang gastos nila. 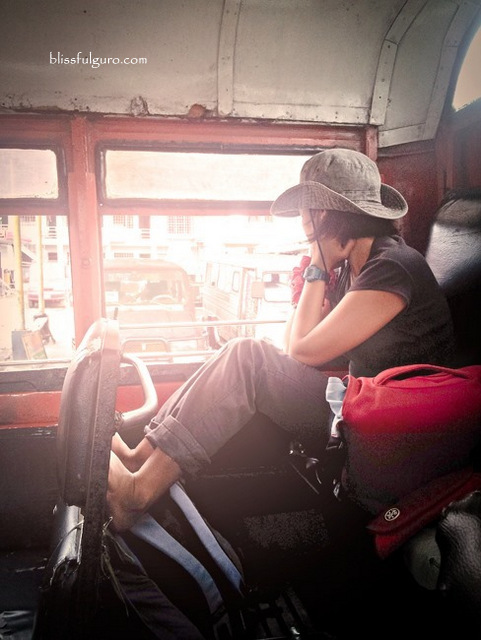 me and my travel budd, on a tight budget kasi. hehe. thanks! hi there! ang bulk kasi ng expenses ah yung transpo from manila. pati na rin yung accomm. 2 nights kasi kami eh. yung 1k di ko siure kung pano nagawa yun eh bus pa lang from manila (one way) is almost 400 na plus the boat fare and other fees. wala pa dun yung accommodation and food. or baka nga naka tent sila. Hello! 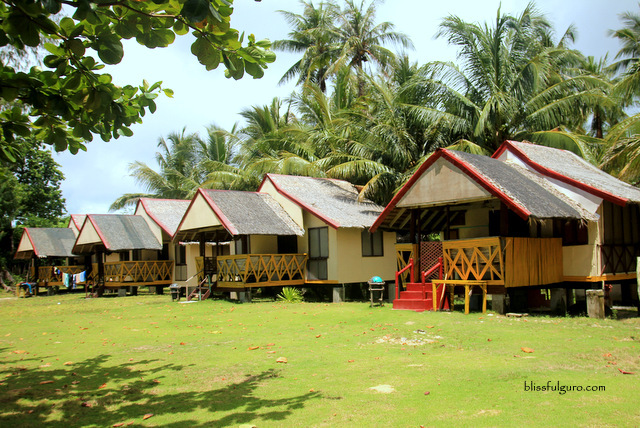 We're planning to go to Cagbalete and still can't decide for resort to stay. 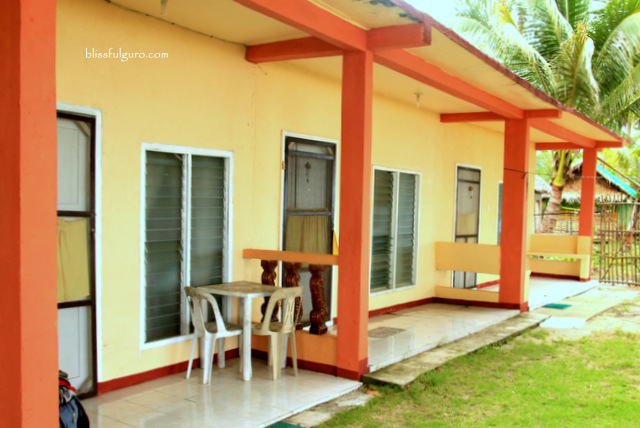 May I ask, iyon bang concrete rooms ng Villa Cleofas ay nakaharap sa beach? Meaning we can view the beach kapag nasa loob ka ng room? Your response will be much appreciated. The schedule wasn't clear to me... 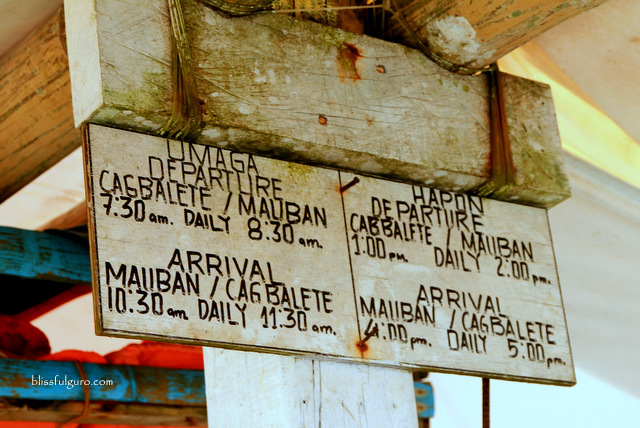 The boat goes to Cagbalete to Mauban vice/versa on an hourly basis? Also, are the coals that good compared to Coron or El Nido? Which hotel has the cheapest rates?